A precious little bird soars through a pillowy sky, with a dainty message! 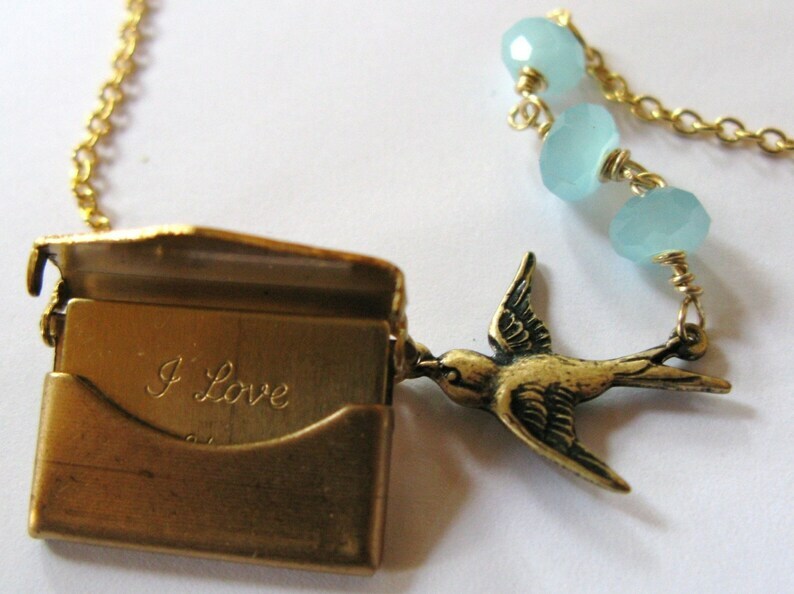 A 1/2" brass messenger bird flies through a pacific sky blue swarovski crystal bead sky, to deliver a 1" vintage locket envelope carrying a special I love you message tag! Removable note can be handstamped with a name, title (like MOM) or date (see photo 3) Each stamping will be one of a kind & rustic, no 2 exactly the same. 16" Gold plated chain, ending in a lobster clasp. Custom length at requst. 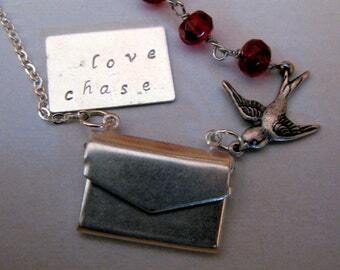 * another seller on Etsy has been copying this style almost exactly :( that i have been selling since June 08. I hope you will respect original art, and support this item through my shop. Thanks!